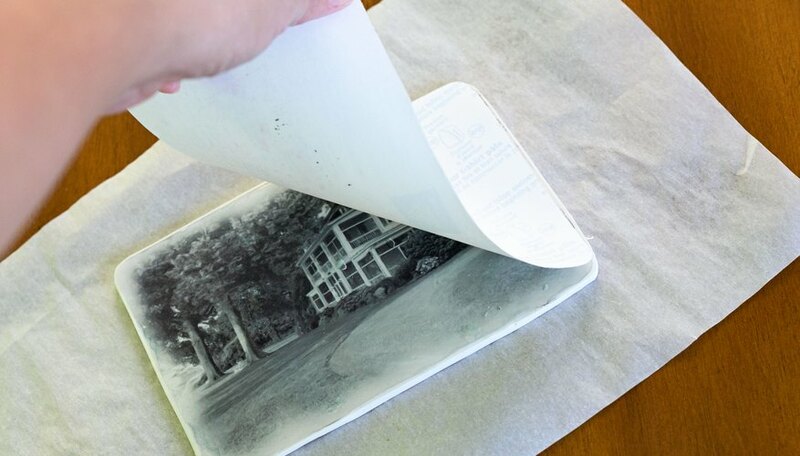 Many methods exist for transferring photos onto ceramic tiles—including photographic silk-screen, Polaroid transfers, laser print, and photocopy transfers. 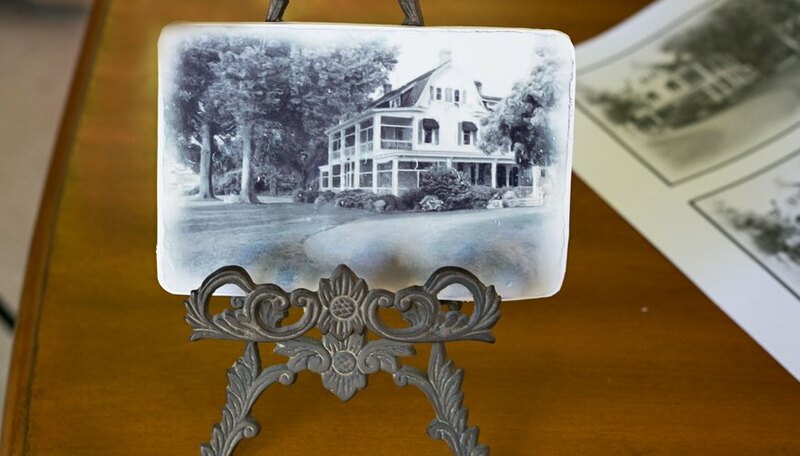 One of the easiest ways to make photo transfers is to print your photos on T-shirt transfer paper and transfer your images onto polymer clay tiles, which can be baked in a home oven. You'll end up with bright, clear photos on custom-sized tiles. 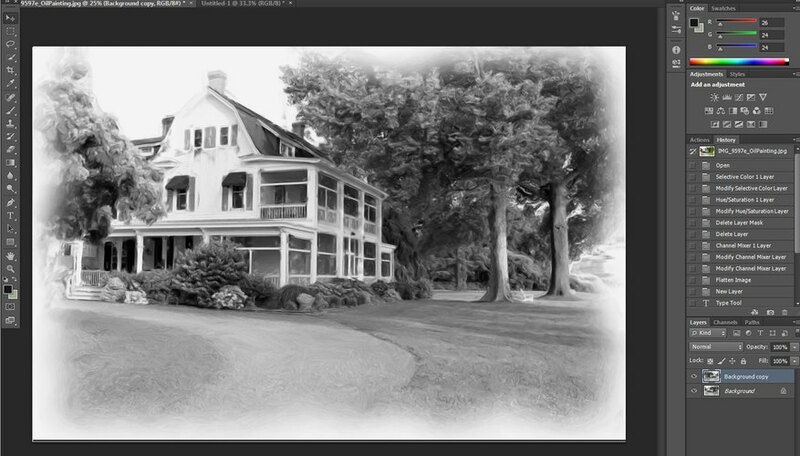 Using your photo editing software, resize your photos to the dimensions you want on your tiles. Make sure the image resolution is at least 200 dots per inch. Print the images on the T-shirt transfer paper, following the manufacturer's instructions. You could also have the transfer prints made at a copy shop. Remember that the transfer will create a reverse image. If you are using text, you will need to flip it horizontally in your photo editing software so that it reads correctly. Knead the polymer clay for about a minute to condition it. Place the clay on top of the tile and roll it out so that it is about 1/4 inch thick. Using the ruler and utility knife, trim the clay to the desired tile size. With your scissors, cut a photo from your T-shirt transfer paper, leaving a 1/4-inch border on one side. 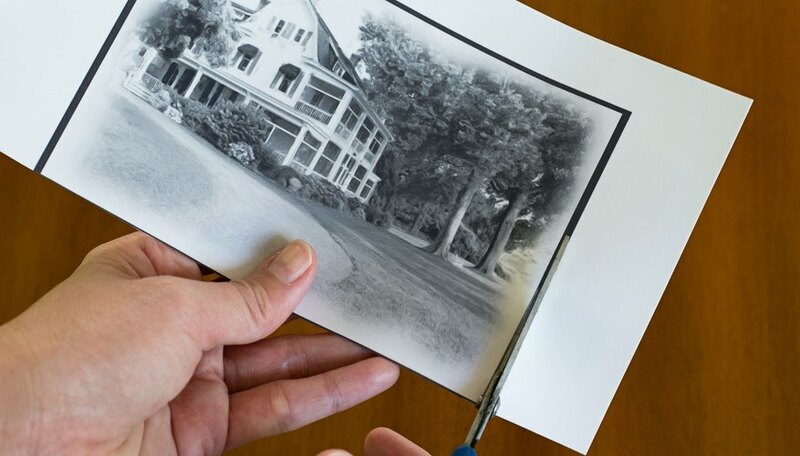 Fold the border back, away from the image, to create a tab—you will use this later to lift the backing paper from the image. Place the image face down on top of the clay. With the back of the spoon, gently rub all over the back of the image. Place the tile, with your clay on top, on the baking sheet. Bake in the oven at the recommended temperature on the clay package (usually about 5 minutes). 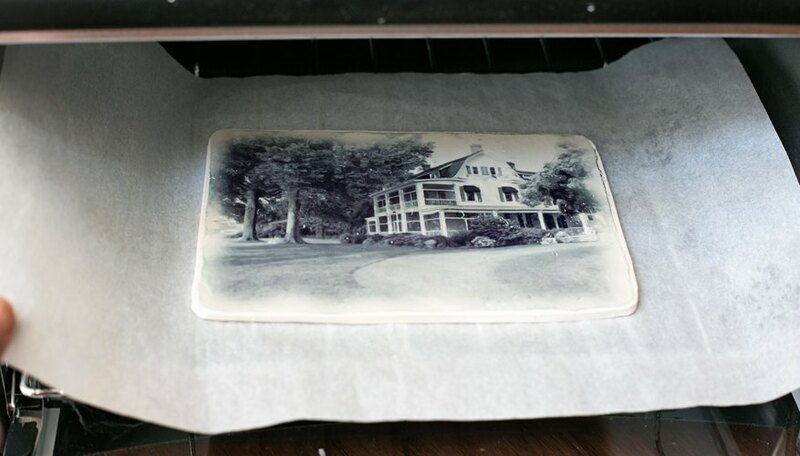 Remove the tile from the oven, and peel away the T-shirt transfer backing, using the tab. Do this slowly, peeling back just a corner at first. If the paper does not peel off easily, or if much of the ink is still stuck to the paper, put the tile back in the oven for another minute or two. The exact baking time will depend on various factors—your oven, the transfer paper, and your images. Return the tile to the oven, and continue baking for the remaining time recommended on the clay package. Let cool. T-shirt transfer paper is available in two types: for light fabrics and dark fabrics. The light-fabric type will create a transparent image, whereas the dark-fabric type will create a brighter, opaque image. This technique works with T-shirt transfer paper formulated for ink jet and laser printers, as well as for color copiers. To save money, print as many images as you can fit onto one sheet of T-shirt transfer paper. Never use the same tools for cooking as you use for craft projects.